Getting into Google’s Answer Boxes is no mean feat for smaller or local businesses, but it can be achieved with a lot of research and just the right content! Here we show you how local businesses can achieve that elusive ‘Position Zero’ in search. In this post, we’re going to take a deep dive into identifying featured snippet opportunities that land you in Google Answer Boxes, but most importantly, how local businesses can create content that allows them to rank ahead of the big brands in the SERPs. Featured snippets are an extremely powerful SEO tactic and a great way of improving your visibility in the SERPs. It’s a super-competitive space, but this doesn’t mean that just because you are a smaller local business, you can’t start ranking for more featured snippets—you just need to know how to find them and how to create content that enables you to compete with the bigger brands. This post will provide some great tips and takeaways to help local businesses and their agencies learn how to rank for featured snippets. As with most SEO-focused work, the starting point for identifying featured snippet opportunities is carrying out in-depth keyword research. As we are focusing on local businesses, it’s important to look at search queries that have a local element. Featured snippets can be extremely difficult to rank for so it’s important to identify any angles where you have a competitive angle because of your locality. One of the best tools we’ve found for identifying featured snippet opportunities is SEO Keyword Magic (Beta) by SEMrush. As well as providing you with in-depth keyword research functionality, where Keyword Magic stands out is by providing you with the ability to filter the keywords by SERP features and, more specifically, by featured snippets. Simply enter a ‘seed’ keyword which has a local angle and hit ‘search’. In the example above (as I’m based in New Zealand, I’ll be using NZ/AUS-focused examples, but the same tactics can still be applied worldwide), we picked ‘auckland’ as our seed keyword and chose Australia as our country. If you are a local travel agent or maybe a hotel or car rental company, you might be interested in providing your visitors with information about the city of Auckland, including things to do there. Questions often form the basis for featured snippet results and as we can see from the results below, there are plenty of Auckland-focused search results that include a featured snippet. We can see that by adding a filter for ‘Featured Snippets’, our results are refined by search queries that deliver a featured snippet in the result—bingo! This ‘seed’ keyword returned 110 additional keywords that contain a featured snippet in the result, with a total search volume of 6,090, which opens up a lot of opportunities for small, local businesses to focus on the featured snippets that can potentially help to drive highly relevant traffic to the site. You can see we also chose to exclude some keywords from the results. 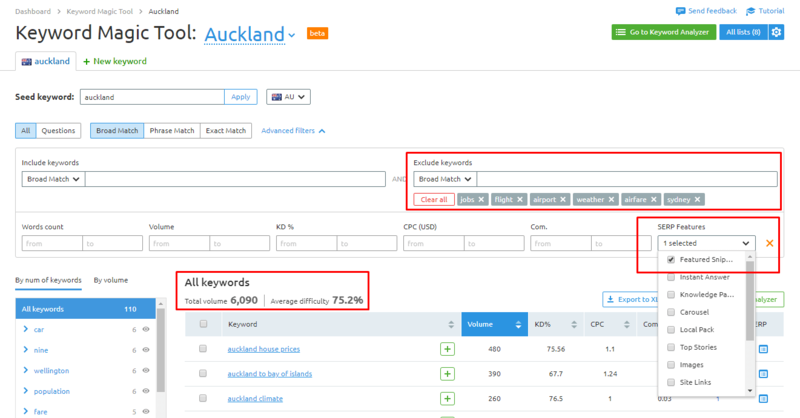 Terms like ‘flights to auckland’ have a high search volume, however the featured snippet is Google’s own flight search widget so make sure you use the SERP viewer to check the actual results for the search queries. From here, it’s possible to send these keywords into SEMRush’s Keyword Analyser Tool where you can dig further into the metrics around those keywords. I won’t be going into too much detail on that process here, but you can find a full breakdown of how to carry out featured snippet keyword research in this great post. You can enter up to eight ‘seed’ keywords into Keyword Magic which will help you to generate hundreds of potential opportunities to find and rank for featured snippets. But what do you do with these keywords and how do you decide which you should focus your efforts on? This is where you need to carry out keyword analysis. We recently watched an awesome Whiteboard Friday from the excellent Britney Muller who presented a spreadsheet for ranking your featured snippet opportunities. We’ve gone ahead and taken this and created a Google Sheet that you are welcome to copy so that you are all good and ready to go with your featured snippet keyword analysis. As we can see from above, this is a very desirable featured snippet for a local business to try and capture. The current ranking URL has relatively low stats when it comes to domain and page authority and includes no markup (see here for more info on schema markup and structured data). The fact that the page also ranks for five other related queries that include featured snippets means the overall search volume for those snippets is 1,000+. By completing your spreadsheet, you will start to see a very clear picture based on the strength of the sites currently ranking for the featured snippet vs the search volume, you’ll be able to and make a decision on whether to target that keyword and featured snippet. This is a perfect keyword hub for a local business to target. It has a decent search volume, there’s a weak site currently ranking and there are opportunities to create a better piece of content which includes relevant markup, optimised copy, a custom map, and images of places to stop along the way—ideal for a car rental company or tourism business based in the Bay of Islands trying to attract people up from Auckland. You should be starting to get a picture of the types of queries that are most likely to return a search result with a featured snippet. If you are in search of more ideas, SEMrush and Ghergich & Co recently undertook a study which looked at 1.6 million featured snippets and 80 million keywords to establish the types of content that are most likely to rank for featured snippets. When it comes to Google featured snippets, search queries that include a question are king. Of the 80 million keywords analysed in the aforementioned study, 41.59% of questions included a featured snippet. 22.67% included a comparison and 17.72% included a preposition. When it comes to questions, the study shows that paragraphs dominate the featured snippet space. 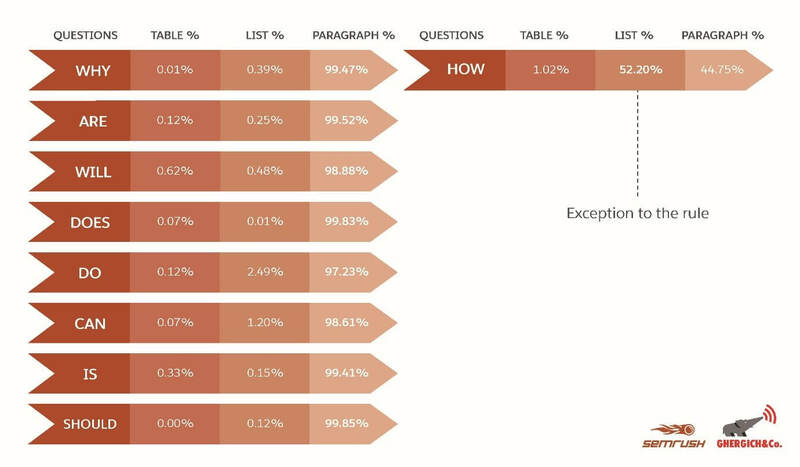 The only exception to this is the ‘how’-based questions, which are perfect for list content. Overall, paragraphs made up 89.57% of the question-based featured snippets so this helps you to structure your content to answer the questions you are targeting. Despite the evidence above, lists are still a very good way to claim a featured snippet, but not only that, they are also great for driving clicks to your site, which is great news for local businesses. Let’s say you’re a local tradesman, like a plumber for example. There are a whole load of small jobs around the house that people can do for themselves (and let’s face it, they’re usually not worth the callout for you). This presents a perfect opportunity for you to get people to your site by helping them with the small jobs so that when a big job comes around, your company is front and centre in their mind. In the example below, we looked at the query ‘how to clear a blocked drain’. This has a search volume of 390 in Australia. This is a job that can be done by anyone at home but there are lots of people looking for advice on the best way to do this. Imagine being able to provide people with a detailed list that offers up a better answer than the current featured snippet. There are lots of potential clicks right there! In the example above, Crunch Betty have actually ensured that no-one will click through to their site. The list they have provided only has five steps, which Google is able to display completely in the SERP. No one needs to click through to the site to find out more because all the steps are already there. The SEMrush survey showed that longer lists should be used wherever possible so that Google is forced to truncate the results. As a local business, you need to give the user a reason to click through to your site. The research revealed that the average number of items per list is 5.5 and the maximum was 8 so try and ensure your lists are over 8 rows in order to get the ‘More items…’ call to action to click for more information. Tables are the third type of featured snippet (as well as paragraphs and lists) and, like lists, you should be looking to create tables that will deliver truncated results in Google. If Google can show your full table in the featured snippet, it is less likely a user will click through to your site as they will have all the information available already. The average number of rows in a table that ranks for a featured snippet is 5.6 and the average number of columns is 3.4. Most tables appear to cut off after two rows (depending on the length of the content in each row) so look to create longer tables with key information in the top 2-3 rows to draw the user in. 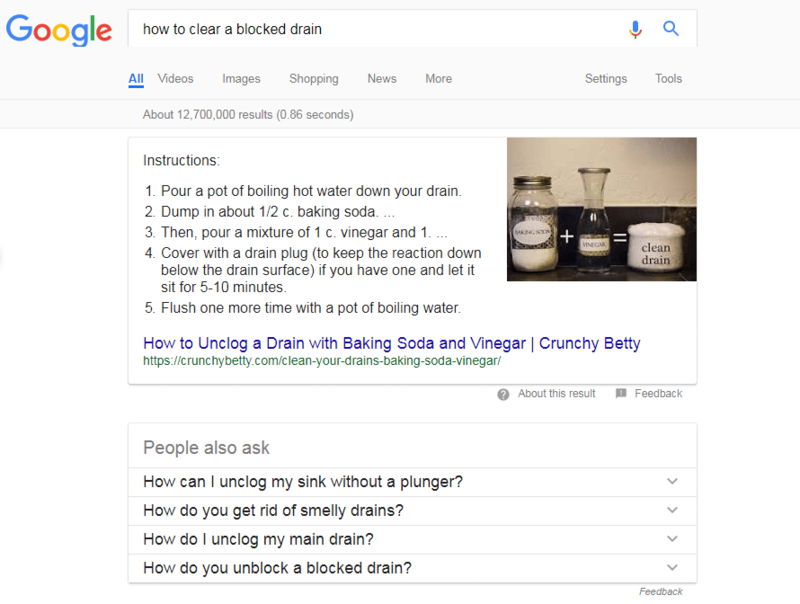 You can see that the exact same URL is ranking for the search query ‘clearing blocked drains’, however, this time there is no supporting image. This doesn’t mean you shouldn’t be using images in your content. There is a lot of value to the end user to adding visual aids to explain what is going on and to drive your points home. The research from SEMrush found that landscape images are most commonly found in Google featured snippets and the most common aspect ratio is 4:3. Like all search results, there are a number of factors that impact on a page’s ability to rank for a featured snippet. Here are some of the key areas to consider. Domain Authority is an indicator of a page’s ability to rank for a specific search query with a featured snippet. The SEMrush research found the median number of linking root domains for featured snippets URLs to be 3,500. This came with a caveat, however. Authoritative domains are always relevant to your niche. Identifying the competition in your niche and comparing domain authority scores is a much better way to assess your chances of ranking for a featured snippet. Local businesses are often an authority within their specific niches, especially for local-based search queries that deliver a featured snippet. There are very few local businesses that will need anywhere close to 3,500 root domains to be considered a topical authority vs the competition, so be sure analyse the competition on a case-by-case basis. Whilst social signals are not necessarily a cause of higher rankings, they certainly have an indirect impact. Of the featured snippet hub URLs identified in the study, 89% had social activity. Engagement provides Google with some pretty strong signals about the quality and relevance of the content so if you are pointing strong social signals to a piece of content, there is a greater chance that your piece of content will be able to rank for a featured snippet. This is almost a no-brainer these days. Google wants to create an internet that is secure for all users. Sites that have migrated to secure https domains have a much greater chance of ranking for a featured snippet. 70% of featured snippet hubs in the study were found to have adopted https. Whilst this still leaves 30% of featured snippets in Google displaying http URLs, we can expect this number to drop over the next 12 months as more and more sites migrate to https. With the move to the mobile-first Google index imminent, it’s imperative that your pages are mobile-friendly. Of the 3,800 featured snippet hub URLs identified by SEMrush, the average mobile-friendly score in Google’s Page Speed Insights was 95/100 and the average usability score was 96/100. The average mobile speed score was 60/100 (although Google has since updated their tool to provide different metrics) which puts sites in the ‘Average’ bracket. If you want to rank for a featured snippet, we would recommend ensuring all your pages meet the minimum score of 80/100 for mobile optimisation in the new Page Insights scoring. This will give you a much better chance of achieving featured snippet status. For local businesses, the mobile-first index provides an opportunity to steal the march on the bigger companies. Local businesses often have much smaller sites so the work required to optimise a small number of pages for the mobile-first index can be much less time-consuming than large companies with lots of pages. We really wanted to focus on how local businesses can compete with the bigger brands when it comes to capturing featured snippets, so we went old school and completed a SWOT analysis of local businesses trying to compete for featured snippets in search. As we can see from the above table, there are definitely opportunities for smaller local businesses to rank for featured snippets. However, these opportunities do not come without challenges. Identifying the competitors for the specific featured snippets you are targeting will tell you whether you are up against bigger brands or other local businesses in your niche. These are the queries that you need to focus on. For local businesses, it’s important to play to your strengths. This means staying away from more generic questions and instead focusing on queries that have a local or niche focus. Your lack of brand awareness, lower domain authority, and smaller social following all mean that you will always struggle to compete with the bigger brands for the more competitive terms. You can, however, leverage the fact that you have a highly engaged local audience on your social platforms. Drive those engaged users to the content that you want to rank for a featured snippet and watch your engagement soar. Local businesses have a real presence within the local community so make sure you tailor your content to that audience. A featured snippet that includes the location you are based in presents the perfect opportunity for you to take full advantage of your local strength and allows you to compete with the bigger brands. For local businesses, it’s important to pick your battles. Follow the steps above, carry out detailed keyword research, analyse the results, and make sure you are targeting featured snippets in search that give you the best chance of ranking. So, we’ve hopefully covered everything to help more local businesses rank for more of the featured snippets out there. From identifying the opportunities to creating the right kinds of content to rank for those snippets, there are a lot of actionable tips above to help smaller, local businesses to compete with the big brands when it comes to featured snippets.